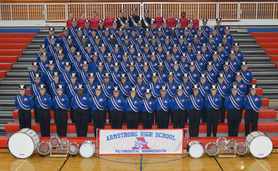 Information on the Marching Band Season can be found using the Calendar, Marching Band, and Handouts/Documents tabs on the left side of this page. This website serves as sign-up location for Parent Volunteering and Student Fundraising throughout the year. We will inform parents and students of these ongoing opportunities during the year with announcements in class, group emails, and our AHS Band Eteamz Website (which you are reading right now). Please check these various locations frequently to stay up to date on the latest opportunities. You are asked to sign-in with an email address but you will not get spammed or receive junk mail from SignUp. Click HERE to go to our Group Page on SignUp. If you have any questions or difficulty with the website, please let us know. Click on the link below to check out our SmugMug Site full of pictures from performances, rehearsals, tours, and events. If you have pictures to add, contact armstrongbandphotos@gmail.com to receive instructions on uploading photos to the site. If you see any errors or have any questions, please contact Colin Woelfle at Colin_Woelfle@rdale.org.